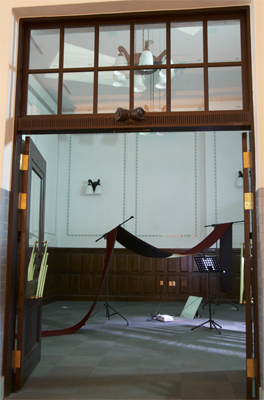 Conceived as a response to the theme of performativity and included in the "Rehearsal" section of the exhibition, Emily D.: The Latent Collaboration bases on the experience of suspension, retreat and of the yet-to-be-born: a collaboration in a music theater group for which Kim started generating video material, the project unrealized for over the past few years. 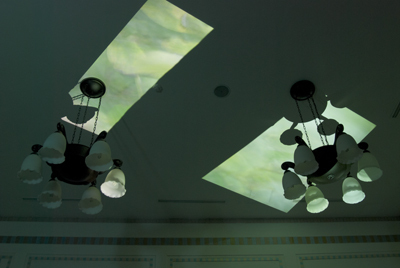 Elaborating the notion that conception, completion and reception of a work is indeed unclear, Emily D. makes the suspended stage of production into an independent piece of its own. Emily D. simultaneously embeds a sense of fascination and reluctance towards the concept of the feminine subject and the manifestation of certain beauty, implied in the video created through a performative shooting. The accompanying song is composed by Aaron Copland to a poem by American poet Emily Dickinson (1830-1886). 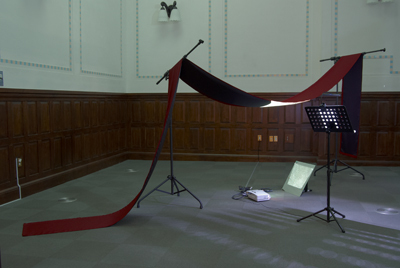 A drape of stage curtain hangs between two microphone stands, drawing shadow to the video projected to the ceiling. 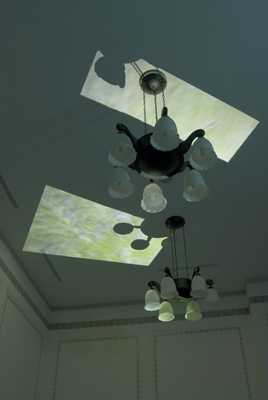 The'disabled' projection lingers as the lyrical vocal number resonatets in the dimmed Women's Waiting Room at the historical former central station. 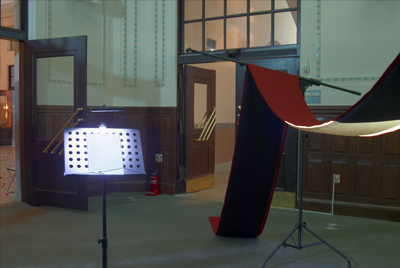 The viewers are led to stand in front of the music stand, lit by the orchestra light. 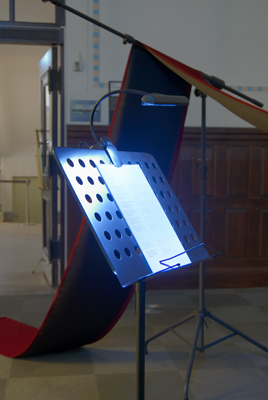 It constitutes an ephemeral and intimate stage through the moment of inner singing, while the viewer glances over the sung text displayed on the music stand. 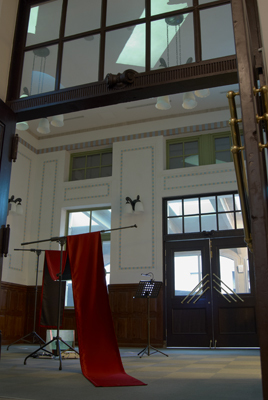 Through this introverted action, the feeling of absence of the missing singer, a completed theater, Dickinson herself or waiting women in journey, quietly and existentially grows. 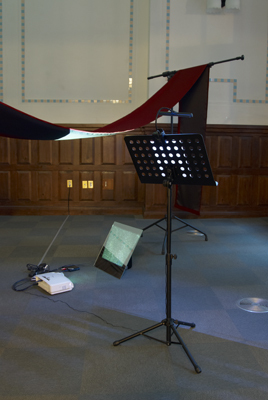 The piece contemplates feminist discourses around Dickinson and the problem of femininity, while questioning on the possibilities and impossibilities of artistic approaches towards it, based on the thoughts activated by the limits and motivations in an 'interdisciplinary' collaboration. The installation exposes a thoroughly imperfect state, where each element exists as itself. <에밀리 D.: 미분화 상태의 협업>은 수년간 개요만 제시된 채 실현되지 못하고 있는 음악극 연출가와의 협업을 주제로 한다. <에밀리 D.>는 작품의 발상과 완성 그리고 수용이라는 일반적인 개념들은 그 경계가 사실상 불분명하다는 사실과 함께, 정지된 제작 과정의 한 단계를 작업으로서 독립시킨다. <에밀리 D.>는 촬영이라는 행위를 퍼포먼스로 해석한 결과 도출된 유려한 영상미를 통해 여성적 자아에 대한 관념과 명시적인 아름다움에 대한 매혹과 거부의 감정을 동시에 표출한다. 카메라는 시공간을 알 수 없는 정원 혹은 숲에서 자연에 취한 듯 풀과 나뭇가지를 하나하나 스캔하듯이 훑어간다. 카메라의 이러한 시선을 위해 동원된 촬영자의 신체는 조심조심 걸어가거나, 고요하고 임의적인 춤을 추게 된다. 미국의 시인 에밀리 디킨슨(1830-1886)의 명상시를 가사로 붙인 성악 가곡이 배경음으로 깔린다. 영상은 허리가 잘린 채 우아하고 고적한 가곡에 맞추어 너울거린다. 영상과 음향은 무한반복된다. 전통적인 연극 무대의 막을 연상시키는 천은 조명용 삼각대 사이에 느슨히 늘어져, 그 사이 바닥에 놓인 프로젝터의 영상을 가로막는다. 천정에는 가운데가 잘려진 영상의 위 아래만이 일렁이게 된다. 설치에 도입된 물질적인 소재는 연극계와 미술계에서 흔히 사용되는 마이크용 삼각대와 암막 그리고 악보대이다. 마주 본 두 대의 삼각대에서 마이크는 제거되었고, 암막은 커튼의 형태가 되지 못한 채 삼각대와 삼각대 사이에 길다란 띠처럼 늘어진다. 암막천은 빛을 차단하여, 관객은 막 아랫면에 영사된 중간 부분의 이미지를 자세히 볼 수 없다. 즉 잘려나간 부분은 영원히 비가시적으로 남는다. 악보대에는 가사에 해당하는 디킨슨의 시가 국영문으로 놓여, 가수를 제외하면 노래를 둘러싼 모든 세팅이 제공된다. 관객은 악보대 앞에서 눈으로 가사를 훑을 때 무대가 되지 못한 무대에 서서 내면적으로 노래부르기에 동참하게 된다. 디킨슨을 둘러싼 페미니즘 담론과 여성성의 문제, 이에 대한 미술적 접근의 문제, 탈장르적 협업의 전형적인 한계 등을 고려하면서 설정된 설치의 모든 요소는 각각 그 자체로 불완전한 상태를 노출시킨다.